Swiss-born artist Sophie Taeuber-Arp (1889–1943) ranks among the pioneers of the classical avant-garde in the first half of the twentieth century. Addressing her art means inexorably falling under the spell of an extraordinary personality. Her work covers the universal range of the modernist movement, from applied and fine art to dance and architecture, from interior design to teaching. This richly illustrated volume chronicles Taeuber-Arp’s multifaceted career—with an emphasis on her design and architectural work. Featuring rarely seen architectural drawings and furniture designs, Sophie Taeuber-Arp traces the artist’s life from her beginnings as a dance student of Rudolf von Laban and her involvement in the Dada movement in Zürich, to her marriage to French writer and artist Jean Arp and her subsequent association with the Swiss Werkbund, to her eventual flight from the Nazis in occupied France and return to Switzerland. 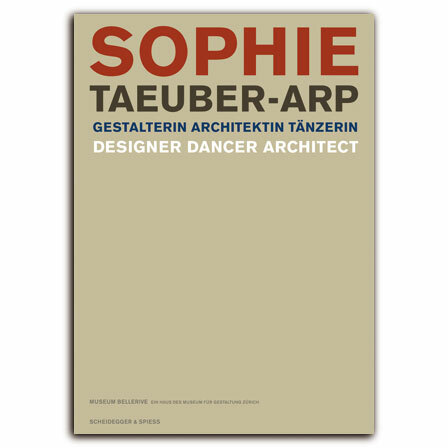 Essays by prominent curators, architects, and art historians, including Eva Afuhs, Martin Heller, Brigitte Maier, and Arthur Rüegg, place Taeuber-Arp’s career in context, making Sophie Taeuber-Arp the definitive book on this extraordinary modernist figure. The book was published to coincide with an exhibition at the Museum Bellerive in Zürich. , born 1962, graduated in architecture from Technische Universität Berlin. She is working as a freelance architect and has been carrying out extensive research on Sophie Taeuber-arp's oeuvre, and especially her work in architecture and interoor design, since 2000 .